Today, 25th April, is a day of remembrance for the many soldiers from Australia and New Zealand who served in all wars, but perhaps especially, and at least originally, those who fought at Gallipoli in World War 1. One of these Australian soldiers was Francis Cavers (1894-1918). Born at Hobkirk near Hawick in Scotland, son of William McLean Cavers and Margaret Robson Jepps, he was a gardener before he emigrated to Australia. He joined the Australian Imperial Force and served at Gallipoli before being invalided out with dysentery. Patched up in time to serve at the Battle of the Somme he received several injuries there, which again saw him invalided out. He returned to the war in late 1917, and was killed in France on 5th April 1918, aged just 24, leaving a widow Elizabeth and young daughter Mary. 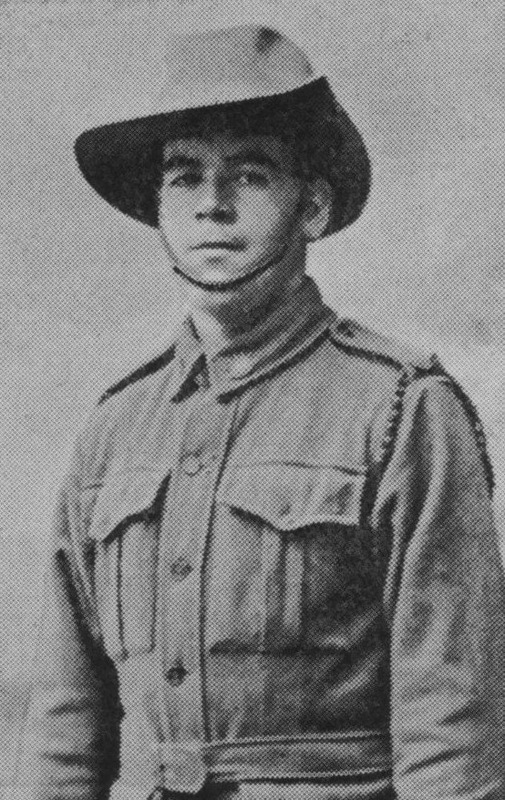 His younger brother John Jepps Cavers had died in 1915, on the way to Gallipoli. Thanks to Derek Robertson of Hawick and the Great War for some of this information, including the photo of Francis’s grave in France which he has just sent me. About a week ago I blogged – originally on my own genealogy blog, and then reblogged here on the Cavers blog – about my Cavers ancestor who appears in the Scotland-wide records of patients admitted to asylums. In that original blog post I explained more fully about these records, and what they record, and how to access them. Do check out that original blog post for more details of all of this. Since then Graham and Emma Maxwell have kindly sent me details of another Cavers reference in these records. This concerns Elizabeth Cavers of the Lilliesleaf family, daughter of Charles Cavers and Martha Cathrae. I’ve blogged here about her brother William (see here) and also her father Charles (see here). She’s recorded in these mental health records as Betsy Cavers or Turner, having married in 1847 weaver Thomas Turner. She was admitted to Newbigging House asylum at Musselburgh in 1858. She was then 34, living at Dunsdalehaugh at Selkirk, with occupation recorded as “Superintending her family”. Her first attack happened when she was 23, but she didn’t receive treatment then. Her latest attack had been going on for one week, and she was observed among other things to be talking incoherently, and under delusions that her house would be taken from her. Her husband also reported that she had threatened to injure the children and others. At the moment I don’t know how long Betsy was in this asylum for, or what treatment she received while there. I hadn’t previously found any evidence of children for her, and struggled to find her in various census returns. But this record expands the picture. And it’s prompted me to recheck for children. After 1855 there were Thomas (1855) and Margaret (1859) both born at Selkirk. Thomas’s 1855 birth certificate – the first year of civil registration in Scotland, when extra details were recorded – notes that the couple had 4 boys and 1 girl living then. And I’ve now found the family in 1861. They were still at Dunsdalehaugh at Selkirk, and as well as Thomas and Elizabeth were their children John (13), Charles (11), Martha (9), James (8), Thomas (5) and Margaret (1). I’ve traced Betsy’s husband’s death in 1902, and his second marriage in 1865 to Isabella Dickson. And that’s helped me finally locate Betsy’s death: recorded as Elizabeth Turner, wife of Thomas Turner weaver, and daughter of Charles Cavers and Martha Cathrae, both deceased. Sadly she died in the Millholme House asylum at Musselburgh in 1862. She was just 38, described on her death certificate as a pauper lunatic, and died from general paralysis. How sad. Betsy Cavers or Turner can now be found in Graham and Emma’s online indexes of Scottish mental health records, which will grow over time to cover more and more years, and I expect will throw up more Cavers references for me to follow up and blog about. I keep an eye on new datasets added to Ancestry. A recent one covers passenger lists to Victoria, Australia between 1839 and 1923. There aren’t many Cavers references in there, but most concern a single family, emigrating from Roxburghshire in the 1850s. Robert Cavers was christened at Hobkirk, Roxburghshire in 1827, the eldest son of Adam Cavers and his wife Janet Clark. In 1847 he married Helen Hymers, and the couple appear in the 1851 census Fastcastle in Cavers parish. Robert was working as a labourer, and by this time the couple had two daughters: Margaret, aged 3, and Jessie, aged 1. A third daughter, Helen, would be born soon after. On 1st July 1853 the family arrived on the ship “Genghis Khan” at Melbourne. I’d known they travelled to Australia, but did not know the exact arrival date before this new database went online. The passenger lists record that Robert was engaged by Mr Campbell at Richmond, now a suburb of Melbourne. This was the time of the Australian gold rush, and the family would soon become involved in this. Sadly Robert died a year later, as the book Rulewater and its people records: “killed in blasting a rock at the gold-diggings”. His wife was pregnant at the time, and a daughter Robina was born in Australia after Robert’s death, named after her father. But the family did not stay in Australia, and made the long journey back to Scotland. The next census reference to them, in 1861, shows them at Ashtree in Southdean parish, Roxburghshire, staying with Helen’s parents Edward and Margaret Hymers. The family can be traced forward in time, and has living descendants today. I’ve blogged before about the Cavers Y-DNA project at Family Tree DNA. In November 2013 I blogged about preliminary results, including for two different Cavers branches. Now we have the results for a total of three different Cavers branches, and I can reveal those here. These results are all from the Y-DNA for male line Cavers descendants. Y-DNA is passed down from father to son, generation after generation. This means that a modern-day male descendant should have inherited the Y-DNA from his distant male line ancestors. And if his family name i.e. surname is passed down from father to son over many generations, with no female illegitimacy links in the chain, this should be a guide to his distant ancestry in that surname line. And that includes Cavers. We now have three Cavers lines represented in the results for the Cavers Y-DNA study. And as before I’m going to spell out the ancestral lines represented by each of the volunteers who has been DNA tested. Volunteer 1 is descended from the mysterious Walter Cavers who was born in Roxburghshire circa 1795, before migrating to Nottingham in England, and having many living descendants. Volunteer 2 descends from Thomas Cavers (ca1810-1879) who emigrated from Castleton, Roxburghshire to Lanark County, Ontario, Canada. This Cavers family can be traced back one further generation, to John Cavers and Jean Douglas, who married in Hawick in 1789 and lived in Castleton. But beyond that it is a mystery. The new volunteer 3 descends from John Cavers and Margaret Cleghorn. This John was a son of John Cavers and Elizabeth Hislop who I have blogged in detail about before. Again this is a Roxburghshire family, and traces back to a couple who married in Hawick in 1793. I am pleased to say that Y-DNA results for all three of these Cavers branches match, suggesting that all three branches have a shared origin further back in time. In other words these lines and their descendants are cousins of each other. There are a few small differences between the DNA results, but not enough to prevent a confident match being made. It is normal for some mutations in DNA to occur over many generations. In addition in the project we have a couple of non-Cavers descendants (at least as far as we know) who have been Y-DNA tested and seem, intriguingly, to be pretty close matches to the Cavers results. Not sure what is happening there – it’s a mystery! But the more Cavers people we can get tested in future, the clearer the picture could become. What I would really like to see is for more different Cavers branches to be tested. For example we haven’t yet had anyone volunteer to be tested from the extensive Berwickshire Cavers family, or the Cavers family including Adam Cavers and his many descendants and cousins, including a large number who settled in Ormstown, Quebec, Canada. Nor have I yet been able to identify a male line Y-DNA carrying living descendant of my own Cavers branch. Basically the more Cavers branches we can get tested, the clearer the picture will become of how they are connected to each other. There will almost certainly be some Cavers Y-DNA results that don’t match others, but that in itself is useful information, and worth knowing. So if you are a male line Cavers descendant who may carry Cavers Y-DNA, especially for a so far untested branch, I would love to hear from you. Or if you are a female Cavers descendant but have a brother or uncle or cousin who may be able to be Y-DNA tested for your branch then that would be great too. I can’t afford to pay for all tests, but have recommended before that cousins can club together to spread the cost of a DNA test. And DNA tests are now at a lower general cost than they have ever been. For more information on the testing process, see my earlier blog post about the project. I will continue to report new results as they come in. Scottish sasine records are records of land transfer and ownership, and are particularly valuable where ancestors owned land, however small. But in many cases, particularly at a local level, they are unindexed, and voluminous to search, so essentially out of reach, unless you can spend a long time in archives in Edinburgh, or pay someone to search the records. Very kindly Graham Maxwell spotted a couple of Cavers references during other research he was doing in local sasine records for Roxburghshire, and forwarded on images of the relevant documents to me. They concern a father and daughter: John Cavers, merchant in Hawick, and his daughter Isobell. The first reference dates from 1739, when John Cavers merchant in Hawick seems to have been owed 14 pounds Sterling as an annualrent regarding a tenement of houses within the town of Hawick. Then in 1756 Isobell Cavers spouse to John Currer Skinner in Hawick had sasine of a tenement of houses in Hawick, presumably the same one, which she inherited as daughter of deceased John Cavers merchant there. There’s no marriage that I could find recorded in the parish registers for Isobell Cavers and John Currer, but they had three children baptised at Hawick: Thomas, in 1742; Mary, in 1743; and Margaret, in 1745. Going back in time I suspect that Isobell may have been the daughter of that name christened at Hawick in 1720, with parents John Cavers and Marion Newbie. Certainly a mother called Marion would fit with Isobell naming her own daughter Mary, a variant of that. The Hawick parish registers in the early 18th century are detailed, including occupations for fathers. At this 1720 baptism the father was noted as John Cavers merchant in Hawick, which definitely fits with the sasine family. On the downside there are other children recorded for John and Marion Cavers, but perhaps they died young. Hopefully more early Cavers sasine references will come to light, as the records hopefully become easier to access. Many genealogists are familiar with the pre-1855 parish registers available at ScotlandsPeople.gov.uk. But, generally, these only include Church of Scotland parish registers. There were an awful lot of other churches in Scotland in the past. Some were of quite different kinds of Christianity, such as Episcopalianism (Church of England) or Catholicism. There were also some other religious or otherwise registers, such as Quakers and Jews. But probably the largest bulk of so-called non-conformist church records are those of breakaway sects of the Presbyterian faith, that splintered out of the Church of Scotland. Not all have surviving parish registers for everywhere they were active, but where they do they are often either in local archives around Scotland, or in the National Records of Scotland in Edinburgh. Generally they are not included in the parish register indexes at ScotlandsPeople. I’ve just received three transcripts of Cavers baptisms from Hawick Free Church. The Free Church was one of the most significant Presbyterian splits in Scottish religious history in the past, taking a huge number of people with it. And the Free Church was active in Cavers home territory in the Scottish Borders. Graham and Emma Maxwell are transcribing and indexing these non-conformist registers, and through the latest additions to their website indexes I was able to trace these new Cavers references, and buy copies of the transcripts from the couple. John, Son of Robert Cavers, Grocer, and Elizabeth McFerson his Wife, was born on the fourteenth day of August one thousand eight hundred and forty-six years, and baptised, in presence of the Congregation, on the thirteenth day of September, aforesaid year, by the Revd. J. A. Wallace, Minister of the Free Church Hawick. Agnes Wilson, Daughter of Robert Cavers, Grocer, and Elizabeth McFerson his Wife, was born on the twenty-first day of January one thousand eight hundred and forty-nine years, and baptised, in presence of the Congregation, on the eleventh day of March, aforesaid year, by the Revd. J. A. Wallace, Minister of the Free Church Hawick. James, Son of Robert Cavers, Grocer, and Elizabeth McFerson his Wife, was born on the twenty- third day of September one thousand eight hundred and fifty years, and baptised, in presence of the Congregation, on the twenty-seventh day of October, aforesaid year, by the Revd. J. A. Wallace, Minister of the Free Church Hawick. EDIT: And here’s one more baptism, the last of this family, just forwarded on to me by Graham Maxwell. Again from the Hawick Free Church baptism registers. Elizabeth Hislop, Daughter of Robert Cavers, Grocer, and Elizabeth McFerson his Wife, was born on the twelfth day of March one thousand eight hundred and fifty-three years, and baptised, in presence of the Congregation, on the twenty-fourth day of April, aforesaid year, by the Revd. J. A. Wallace, Minister of the Free Church Hawick.